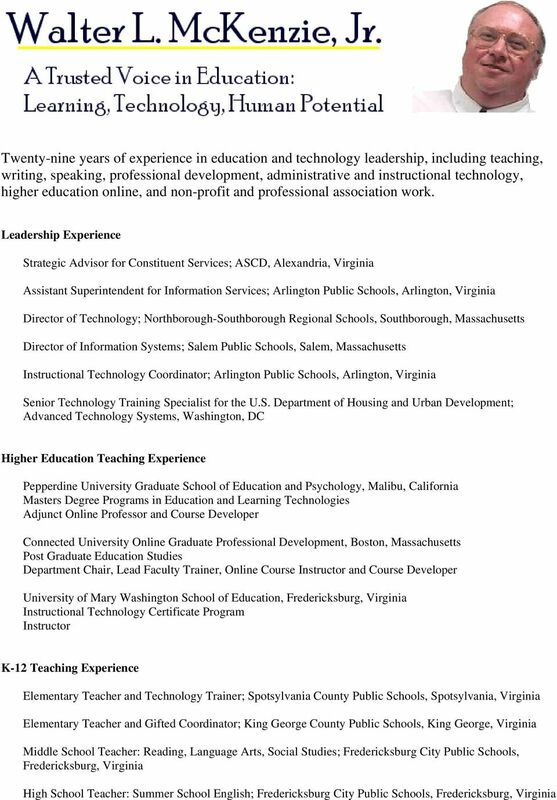 Download "Strategic Advisor for Constituent Services; ASCD, Alexandria, Virginia"
4 McKenzie, page 4 McKenzie, W. (2004). Integrating Literature and the Arts into Technology-Based Instruction: A New Unit Model for Educators" Linworth: Library Media Connection, August 2004, pp McKenzie, W. (2003). What Makes Online Courses Work? 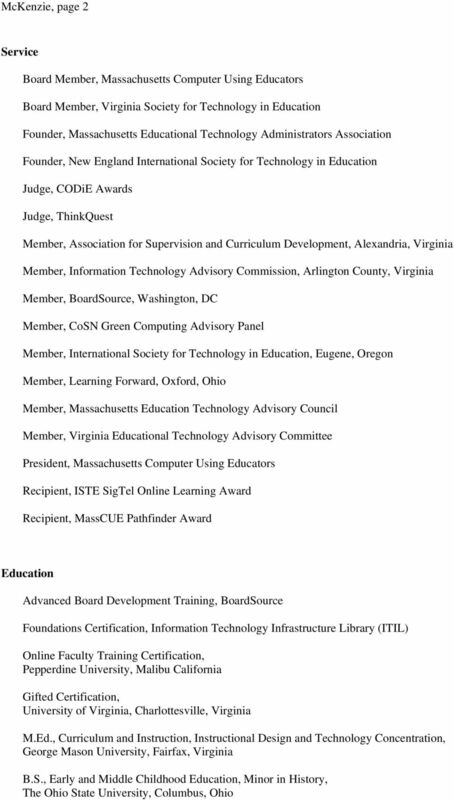 On Cue: Massachusetts Computer Using Educators. 2003, pp. 9 11, McKenzie, W. (2003). Find the Best Software: Using Bloom's Taxonomy and Multiple Intelligences to Select and Use Software. 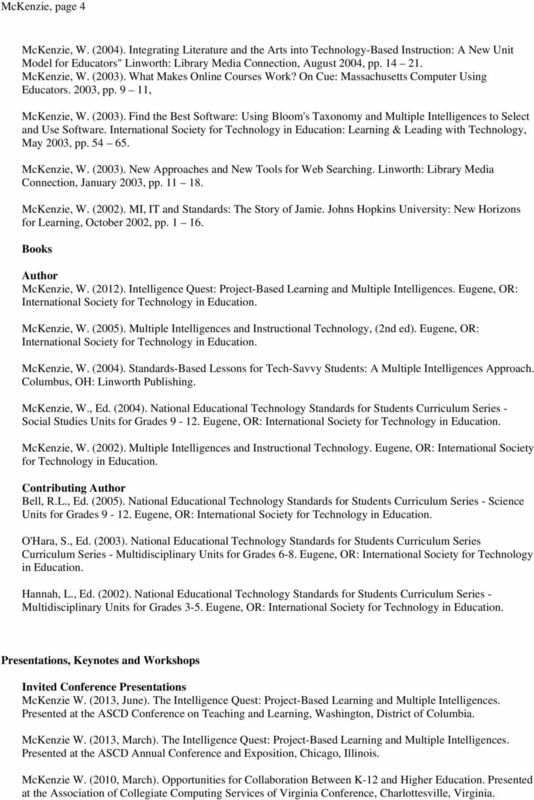 International Society for Technology in Education: Learning & Leading with Technology, May 2003, pp McKenzie, W. (2003). New Approaches and New Tools for Web Searching. Linworth: Library Media Connection, January 2003, pp McKenzie, W. (2002). MI, IT and Standards: The Story of Jamie. Johns Hopkins University: New Horizons for Learning, October 2002, pp Books Author McKenzie, W. (2012). Intelligence Quest: Project-Based Learning and Multiple Intelligences. Eugene, OR: International Society for Technology in Education. McKenzie, W. (2005). Multiple Intelligences and Instructional Technology, (2nd ed). Eugene, OR: International Society for Technology in Education. McKenzie, W. (2004). Standards-Based Lessons for Tech-Savvy Students: A Multiple Intelligences Approach. Columbus, OH: Linworth Publishing. McKenzie, W., Ed. (2004). National Educational Technology Standards for Students Curriculum Series - Social Studies Units for Grades Eugene, OR: International Society for Technology in Education. McKenzie, W. (2002). Multiple Intelligences and Instructional Technology. Eugene, OR: International Society for Technology in Education. Contributing Author Bell, R.L., Ed. (2005). National Educational Technology Standards for Students Curriculum Series - Science Units for Grades Eugene, OR: International Society for Technology in Education. O'Hara, S., Ed. (2003). National Educational Technology Standards for Students Curriculum Series Curriculum Series - Multidisciplinary Units for Grades 6-8. Eugene, OR: International Society for Technology in Education. Hannah, L., Ed. (2002). National Educational Technology Standards for Students Curriculum Series - Multidisciplinary Units for Grades 3-5. Eugene, OR: International Society for Technology in Education. Presentations, Keynotes and Workshops Invited Conference Presentations McKenzie W. (2013, June). The Intelligence Quest: Project-Based Learning and Multiple Intelligences. Presented at the ASCD Conference on Teaching and Learning, Washington, District of Columbia. McKenzie W. (2013, March). The Intelligence Quest: Project-Based Learning and Multiple Intelligences. Presented at the ASCD Annual Conference and Exposition, Chicago, Illinois. McKenzie W. (2010, March). Opportunities for Collaboration Between K-12 and Higher Education. Presented at the Association of Collegiate Computing Services of Virginia Conference, Charlottesville, Virginia. 5 McKenzie, page 5 McKenzie, W. (2009, May). Strategies for Green Computing. Presented at the Association of School Business Officials Spring Conference, Ocean City, Maryland. McKenzie W. (2006, July). Matching Technologies to Intelligences in Instruction. Presented at the Building Learning Communities Conference, Regis College, Weston, Massachusetts. McKenzie W. (2006, July). Mapping to All the Intelligences following the Iditarod. Presented at the Iditarod Teachers Conference, Wasilla, Alaska. McKenzie W. (2005, November). Multiple Intelligences and Instructional Technology. Presented at the Massachusetts Association of Computer Using Educators Conference, Sturbridge, Massachusetts. McKenzie W. (2005, July). Digital Guilds: Building Online Communities. Presented at the Building Learning Communities Conference, Regis College, Weston, Massachusetts. McKenzie W. (2005, May). Multiple Intelligences and Instructional Technology. Presented at the Beyond Technology Conference, Springfield, Massachusetts. McKenzie W. (2005, March). Multiple Intelligences and Technology in the Classroom. Presented at the ASCD Annual Conference and Exposition, Orlando, Florida. McKenzie W. (2004, December). Multiple Intelligences and Instructional Technology. Presented at the Educational Technology Leadership Conference, Roanoke, Virginia. McKenzie W. (2004, October). Keynote: It s Not How Smart You Are, It s How You Are Smart. Presented at the Virginia Society for Technology in Education Annual Conference, Norfolk, Virginia. McKenzie W. (2004, July). Multiple Intelligences and Instructional Technology. Presented at the Building Learning Communities Conference, Regis College, Weston, Massachusetts. McKenzie W. (2004, March). Multiple Intelligences and Instructional Technology. Presented at the Michigan Association for Computer Users in Learning, Detroit, Michigan. McKenzie W. (2003, May). Multiple Intelligences and Instructional Technology. Presented at the Georgia Educational Technology Conference, Macon, Georgia. McKenzie W. (2002, April). Multiple Intelligences and Technologies for Young Children. Presented at the Delaware Valley Association for the Education of Young Children Conference, Philadelphia, Pennsylvania. McKenzie W. (2002, June). Multiple Intelligences and Instructional Technology. Presented at the National Educational Technology Conference, San Antonio, Texas. McKenzie W. (2002, April). Multiple Intelligences and Technologies for Young Children. Presented at the Ohio Association for the Education of Young Children Conference, Columbus, Ohio. McKenzie W. ( ). Multiple Intelligences and Instructional Technology. Presented at Classroom Connect Conferences nationally. Invited Faculty Presentations McKenzie W. (2006, August). Multiple Intelligences in the Classroom. Presented at St. Agnes Academy, Alliance, Nebraska. McKenzie W. (2006, June). Multiple Intelligences in the Classroom. Presented at the Kamehameha Schools, Honolulu, Hawaii. Cecil Francis Carter Florida Gulf Coast University College of Education 10501 FGCU Boulevard South Fort Myers, Florida 33965-6565 (239) 590-7794 ccarter@fgcu.edu Education and Professional Training Ed.D. Brian Alan Snyder, Ph. D.
Thomas J. C. Smyth, Ph.D. 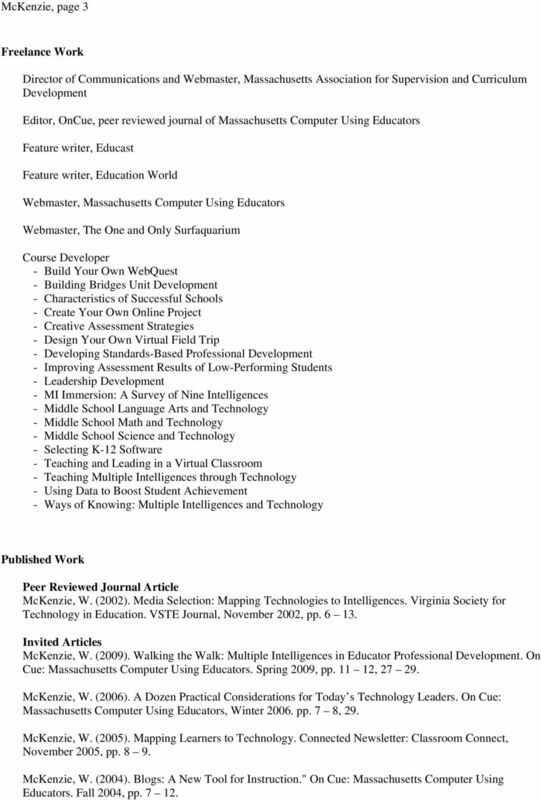 Page 1 Michelle A. Maher Education Ph.D. George Mason University, Fairfax, VA, 2001 Specialization: Higher Education Administration Dissertation Title: Living and Learning in an Educational Cohort M.A. PETER CLYDE MARTIN Associate Professor of Education PhillipsHall 194C Ithaca College Ithaca, NY 14850-7281 pmartin@ithaca. CLASSIFICATION APPEALS WITHIN THE MARKETING AND REGULATORY PROGRAMS MISSION AREA. a. AMS Directive 310.1, Classification of Positions, dated 4/15/91. other distance education innovations, have changed distance education offerings. CURRICULUM VITAE Elizabeth Mahon 275 29 th street Boulder CO 80305 Phone: 303-248-3408 E-mail: Elizabeth.mahon@ucdenver.edu EDUCATION 2004 Ph.D., Social, Multicultural and Bilingual Foundations of Education. CONFERENCE 2013 SCHOOL COUNSELORS: GETTING TO THE HEART OF THE MATTER If you are a school counselor in Kentucky then the place to be March 6-8, 2013 is in Lexington! This year, we decided to Think Big!